Danish krone (Denmark’s krone) was adopted already in 1885, after being part of the Scandinavian Monetary Union. Denmark’s krone has now fixed exchange rate against the Euro. How much are the DKK traded? 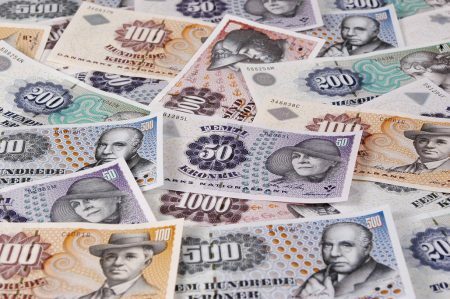 Kroner (Danish), danske kroner (Danish), dansk krone (Danish), Dkr (unofficial abbreviation) and Kr (another unofficial abbreviation) are some of the most common names for the Danish currency. The official countries using the Danish krone are Denmark, Greenland and the Faroe Islands. How much is the Danish Krone traded? Denmark has a currency that is relatively small and has chosen to be associated with the växelurs to the euro. Danish Crown is not among the 15 biggest currencies in the world and most currency traders prefer dealing with the Euro, which have much higher volumes. The official ISO code as both currency traders and money exchange offices are using is DKK, while the Danes themselves sometimes writes or KR DKK (DKK) to express that the currency is Danish kroner. On 1 January 1999 as Denmark entered into a new fixed rate co-operation with the Euro zone. The exchange rate 746.038 DKK. per. EUR 100 was in force. The standard deviation within ERM2 is + / – 15%, but Denmark was a narrow strip, only + / – 2.25% deviation from ovandestående exchange rate is allowed. On 28 September 2000, there was a referendum if Denmark should join the Euro or not. The result was that 52.3% voted no, while 46.8% voted yes. foreign, short-term loans. When financial crises in 1907 abroad increased, so did the Danish banks in crisis the following year. 1933 came as a significant weakening of the Danish currency, the entire 24% devaluation against the pound sterling. Britain announced in 1949 that the pound would be devalued 30% against the dollar. Denmark followed suit. In 1982, the bourgeois government decided to switch to fixed exchange rate against Germany (Deutsche Mark), as the currency had struggled with several serious impairments in recent years. 2008, the Danish krone has seen a significant increase in severe that many Danes now travel to Malmo to shop, especially during the holiday shopping season. Prices in Sweden are often at least 50% lower, which damaged the Danish retail trade. Stable prices: Denmark pursues a low inflation just below 2%. Secure payments: National Bank contributes to the cash and electronic payments are settled safely. Since Denmark applies a fixed exchange rate policy is the Danish krone entirely dependent on what happens to the euro. Below are some common notes from Denmark.